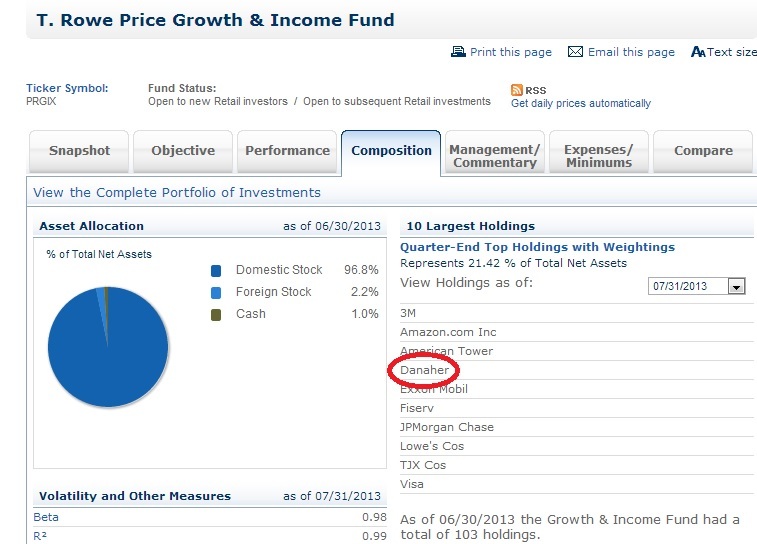 I was recently screening the top ten holdings of every mutual fund that T Rowe Price offers to look for some investment ideas worth considering. When I got to the company’s more traditional funds aimed at retirees and conservative investors, I noticed one stock that kept showing up: Danaher. It is a “Top 10 Holding” in the following four funds (if not more): Blue Chip Growth, Capital Appreciation, Growth & Income, and Dividend Growth. 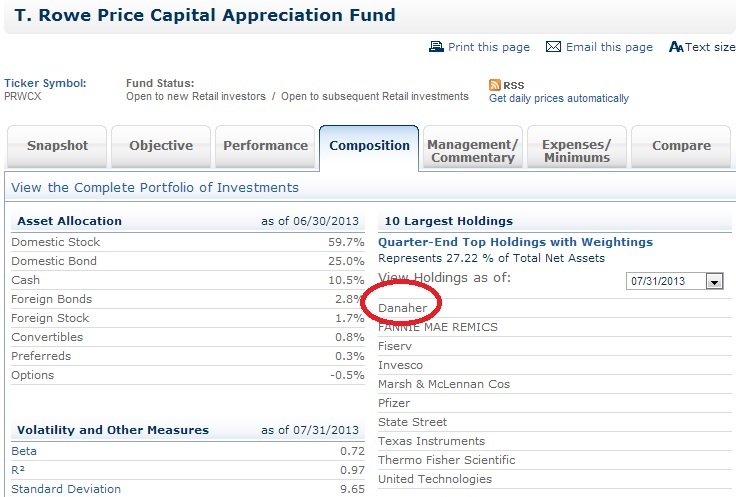 It is somewhat ill-fitting to see Danaher show up in T Rowe Price’s Dividend Growth Fund, considering that the company only pays out a dime for each share annually for a dividend yield of 0.15%. If you wanted make a schoolteacher’s salary off of your Danaher stock (~45,000 per year), you would need to own 450,000 shares of the company. At a current price of $67 per share, we’re talking an initial investment of $30,000,000+ to make that happen. 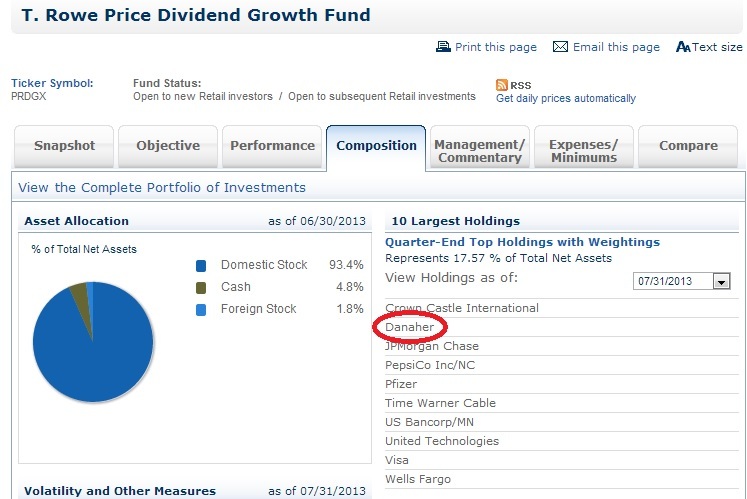 Not exactly sure what that company is doing as a top holding in a Dividend Growth or Growth & Income Fund, but what do you expect when the Dividend Growth Fund’s top holding (Crown Castle International) doesn’t even pay a dividend to shareholders? Perusing through the top holdings of various mutual funds is a worthwhile exercise because, a lot of times, the funds don’t hold the kind of companies you’d expect. 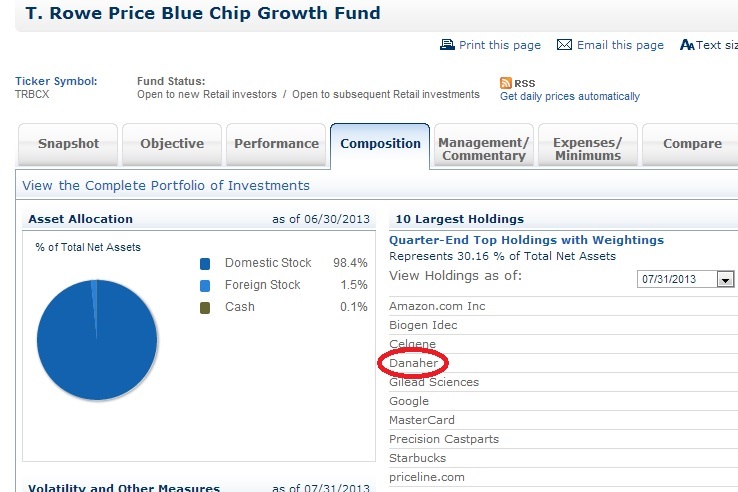 I mean, look at the top holdings in the Blue-Chip Growth Fund: priceline.com, Gilead Sciences, Google, Mastercard, Amazon, Biogen, Celgene, Starbucks, etc. are the kinds of companies you’d expect to fill a growth fund, and I would have thought the blue-chip portion of the mutual fund’s title would have led the company to choose more conservative growth stocks (like Philip Morris International, Colgate-Palmolive, etc.) as top holdings. I’m going to have to think about this one some more. As of right now, I’m not sure what to make of the fact that almost every traditionally conservative fund at T Rowe Price has a sizable position in Danaher. It has a strong “one of these things is not like the other” feel to it. Maybe it belongs in the Capital Appreciation Fund, but I’m not sure there are many logical grounds for its inclusion in the other three.